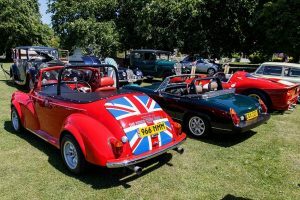 Sherfield Fête’s display of enthusiast’s vehicles is a regular and popular feature of the day. We usually have around 20 vehicles of various types for visitors to admire and photograph, and owners who are happy to discuss their cars, bikes and other vehicles. If you would like to bring your pride and joy along on the 8th of June, please complete the form below. Be sure to read and agree to the simple terms and conditions. We will get back to you to confirm that we are expecting you.